Splash pages, you gotta love 'em. A blank canvas where the artist can hit you with a large dose of illustrated 'wow'. This splashie comes from Kelley Jones amazing artistic run within DC's Bat-universe. Kelley made Batman a true spectre of the night, elongated limbs and a cape that almost became a character in itself. 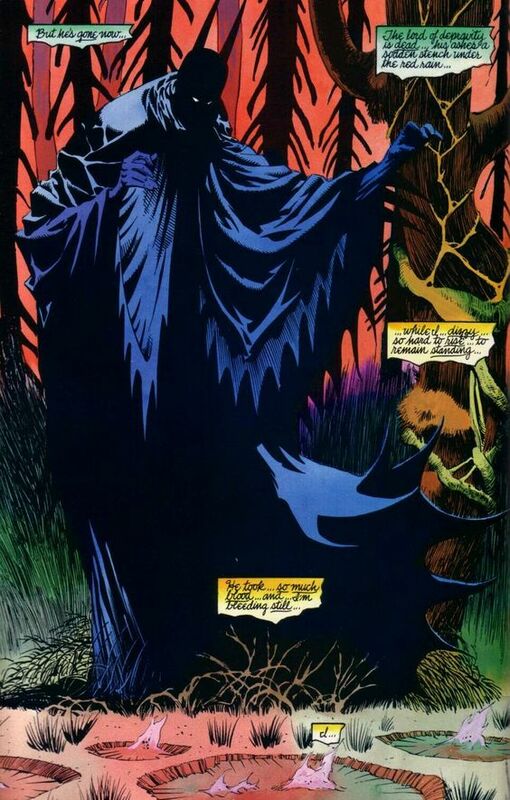 Every drape and every fold made you think that the Dark Knight was a nightmarishly fun character that you might have found during Jones' run on Sandman. Unlike nightmares though, when Kelley Jones pencils art like he currently is on DC's Swamp Thing mini-series the visions never leave you and never stop being amazing. Scenes like this definitely show that Mr.Jones was born to draw Batman. Love his whole Vampire Batman trilogy. He sure was Dale - I just wish he'd get the Spectre sooner or later! !